Home hair colour kits are much better than they used to be. With a larger selection of colours and shades higher quality ingredients, and easier to use applications home hair colouring is safer and provides better results than ever before. However, if you choose the wrong colour, don't apply the colour correctly, or neglect to prepare your hair properly beforehand you could end up with a permanent colour disaster. The key to getting great results from a home colour is in the choice of the colour. Not every hair colour or shade will take well to every new colour choice. In order to choose the best, most natural looking hair dye you need to take into account your skin tone, your natural hair colour, and the natural colour of your eyebrows. Lighter hair matches better with lighter skin tones and individuals with darker skin tones can pull off dramatically darker hair shades (like jet black) far better than their paler counterparts. So, if you have pale, light, or freckly skin your best colour choices will be "cool" in shade and include variations from light or platinum blond to darker blondes, strawberry blondes and light browns or auburns. If you have olive skin tones or darker skin good choices will be any of the "warmer" hair shades such as chestnut or mahogany browns, deep brownish reds, and blacks. When choosing a new hair colour you also need to factor in the colour that you are starting with. The natural colour of your hair can affect how the artificial colour looks once applied. For example, grey hair will cause the colour on the box to turn out at least one shade lighter. And, some lighter hair dyes will bring out unwanted red tones in naturally brown hair. Finally, black hair will not become platinum blonde no matter what the box says unless you first strip the natural colour from very dark hair strands. And lastly, in order to get the most natural looking dye job you must also factor in the colour of your eyebrows. If you colour hair darker than your eyebrow colour your eyebrows will seem to disappear from your face and result in an unnatural looking style. If you go way lighter with your new hair colour your eyebrows will stand out dramatically and actually look bushier, and hairier than they really are. For the best results choose a new colour that is within two shades of your natural eyebrow colour. If you wish to make a more dramatic change you should consult a professional colourist first. Getting a great dye job is not as simple as just plopping on the colour. You need to follow a few do's and don'ts with hair colouring to ensure the best results. Do take your time choosing a colour. Shop around and compare the many shades that are offered. You do not want to rush into a permanent hair colour change. Do deep condition your hair at least two days before applying colour. This will help prepare the hair for equal colour absorption and protect the hair strands from chemical damage. Do perform a strand test prior to colouring to ensure that the shade is right and that your skin is not allergic to the formula. And finally, do follow the instruction from the kit exactly. Leaving the colour on too long can cause unwanted hair damage and not leaving it on long enough will affect the final shade results. Don't wash your hair the day you will be colouring. Dyes need something to hold onto for the most effective coverage so you will want your strands to be coated with a little natural oil before the dyeing application. Don't attempt to colour damaged or overly processed hair at home. The colour will most likely turn out differently than planned and the chemicals will further damage the hair strands. Always consult a professional for damaged hair colouring. Don't rush the colour job. Take your time, or better yet enlist the help of a friend, in order to ensure that every strands gets equal, balanced colour. Don’t colour your hair in an enclosed space: the fumes from the chemicals can be toxic. And finally, don't use an old colouring kit or one that has previously been opened. These kits will not work on the hair correctly and can result in a very unwanted shade. Before beginning the colour job you need to have the correct supplies on hand and a general understanding of the proper dyeing technique. Needed items include a small comb (preferably one with a pointed handle to better separate hair sections), a few old towels (for draping the body and catching spills), cotton balls (to mop up drips), hair clips (to hold back hair sections), and some petroleum jelly (to smear around the hairline and keep colour from staining the skin). Once you have your supplies ready it is time to colour. Begin by separating your hair into at least three sections: back, left side, and right side. Use the hair clips to hold back two sections while you are working on the third. Begin applying the dye mixture at the roots of the hair using your fingers or an application wand or brush. Cover both sides of the hair strands before moving onto the next section of roots. Once all of the hair roots are covered start applying colour to the rest of the hair strands. Using the wand or your fingers pull the colour mixture down the hair strand on both sides until all hair is completely coated with dye. Once the entire colour mixture is applied allow the dye to penetrate the hair strands for the time period recommended by the colouring kit. 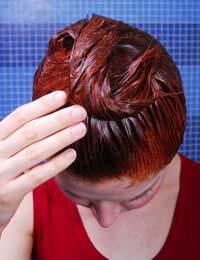 Once the time is up rinse the dye from the hair thoroughly with cool running water. Once the water runs clear you can cleanse your hair with a mild shampoo (such as a shampoo formulated for children) and condition as usual.